We knew it wouldn't take long for screenwriter David S. Goyer's strengthening relationship with Warner Bros. to yield results, and the latest rumor is a potential knockout. It seems that the screenwriter for Batman vs. Superman isn't content with just DC Comics' biggest superheroes, as he's currently pitching a big screen take on Neil Gaiman's legendary graphic novel, The Sandman. If that weren't enough to get comic book fans stirring, the same rumor claims that Joseph Gordon-Levitt is also involved, presumably intended to star. The report comes courtesy of BadassDigest, who seem to have an inside track on rumors concerning comics published under DC's Vertigo imprint, as evidence of a Preacher series from Seth Rogen and Evan Goldberg continues to mount. According to their sources, the project is in extremely early stages, with Goyer simply pitching his take on the character to WB executives (it's unclear if Gaiman himself has even been contacted). However, Geoff Johns (DC's Chief Creative Officer, and general overseer of the company's characters) is apparently putting his support behind the writer's approach. But without a doubt, it's the claim that Joseph Gordon-Levitt is involved in the talks that is sure to get tongues wagging. It's presumed that Gordon-Levitt is intending to play the titular god of dreams, but there's no explicit evidence that his role would be in front of the camera - that's merely a logical assumption. And given the actor's track record, 'Dream' seems to be a fitting role. When Joseph Gordon-Levitt recently confirmed that he was talking superheroes with Marvel - despite playing a pivotal role in Christopher Nolan's end to the Dark Knight Trilogy - it seemed that Warner Bros. and DC Comics had missed their chance to build a new comic book-based film franchise around the actor/writer/director's rising star. There would be no bigger headline than the actor attaching his name to one of the most widely-praised pieces of graphic literature in the last century, and cementing his ties with DC and Warner Bros. This rumor doesn't necessarily rule out the possibility of Gordon-Levitt lending his talents to either Ant-Man or Dr. Strange over at Marvel, since it's not the first time word of an adaptation of The Sandman has surfaced. DC has made no secret of their desire to adapt the project in one form or another, despite a TV series failing to get off the ground. Still, the desire is widespread, with The Wolverine director James Mangold naming the graphic novel as one comic he'd love to tackle. We don't need to make a case as to why The Sandman is a wise series to adapt; beginning with the the Lord of Dream's escape after decades of imprisonment, the story delves into a fantastic and surreal realm that not only made Vertigo one of the most well-respected names in comics, but proved that comic books could contain truly accomplished writing. And all things considered, Warner Bros. seems the best studio (out of the current comic book-crazed studios) to adapt the series. However Man of Steel may have been received by comic fans and moviegoers, Goyer proved that he can take a comic book story seriously. And if Geoff Johns is putting his weight behind the writer's take on one of DC's most revered titles, we'd give him the benefit of the doubt. For the time being, we'd recommend cautious optimism on the part of fans. Goyer is certainly gaining influence with Warner Bros., meaning his interest - backed by DC's highest-ranking executives - is a massive step in the right direction. And although the project is still a long way from completion, an actor like Joseph Gordon-Levitt showing interest could help tip the scales. If that's the case, Marvel might need to change their plans. Assuming these rumors are true, of course. What do you think of the likelihood that Goyer will succeed where others have failed? Could WB's recent interest in adapting as many properties as possible give their Vertigo titles more time in the spotlight? And if so, could a better actor than JGL ever be considered? Share your thoughts in the comments. 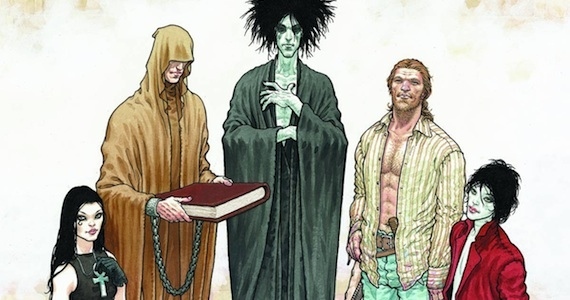 We'll keep you posted as news on any adaptation of The Sandman arrives.